One of the most popular trends for gift giving is personalized photo items. 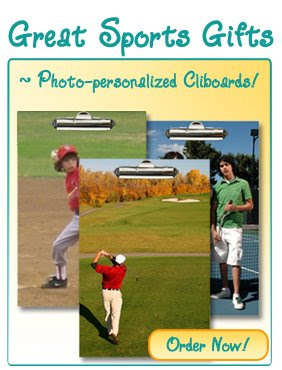 FeeFiFoto offers a clipboard that is sure to be a big hit for that special guy in your life . . . whether he is a manager, a coach, or someone who just likes to stay organized at home or at work. These clipboards have 9x12 inch writing surfaces. They can be personalized by uploading an image right into your FeeFiFoto photo album. There is no minimum quantity requirement and no set fee. 1) Their selection of personalized photo gifts for men is not limited to clipboards and includes sports balls, steins, playing cards, watches, and much more. 2) Most items require up to 3 days for production. 3) There are not set up fees or personalization fees. You only pay for the item plus shipping and any applicable sales tax. 4) You should double-check your order prior to checking out and completing your purchase. Once you have checked out, an automated system begins to process your order and it cannot be stopped to make changes. FeeFiFoto offers such a large selection of items and such a wide range of prices, you could likely do most of your holiday shopping on this one site. As always, any store owner who has had an item featured as an ABOG Top Pick is welcome to display the badge on their website or blog.